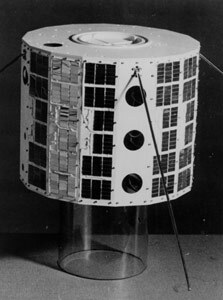 The satellite Injun 1 was the first of a series of spacecraft designed and built by the University of Iowa to study the natural and artificial trapped radiation belts, auroras and airglow, and other geophysical phenomena. Injun 1 was launched simultaneously with Transit 4A and Solrad 3 / Grab 3. For launch, the cylindrical Injun 1 was contained in a cage-like structure between Transit 4A and Solrad 3. Transit 4A successfully separated from Injun 1, but Grab 2 (Solrad 3) did not. Injun 1 was designed to be magnetically aligned. 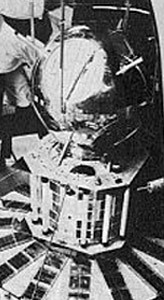 However, due to the presence of Solrad 3 / Grab 3 (which blocked the view of the photometer), it was impossible to keep the satellite constantly oriented on the terrestrial magnetic field throughout an orbit. A single axis fluxgate magnetometer was used to monitor the orientation of the spacecraft with respect to the local magnetic field. Injun 1 had a complex spin-and-tumble motion with an ill-defined and variable period of several minutes. The satellite sent back radiation data until 6 March 1963, and is expected to be in orbit for about 900 yr.